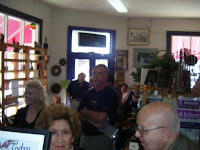 Last Saturday I was scheduled to give a 2 hour talk on making your mind recession proof. 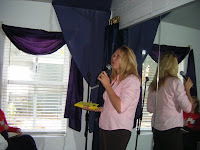 This was a free talk I was giving in honor of World Hypnotism Day. 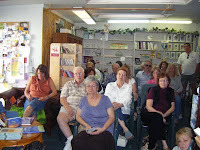 It was held at Oak Trail Books, a lovely book store that hosts this event annually for me. Press releases were sent out in advance and the result was amazing. I am still receiving calls from folks who saw articles written about the event in newspapers and periodicals I was unaware of. Our local CBS affiliate had me on in the morning show, at 5:45 a.m. and 6:45a.m.! (That was a testimony to my dedication to hypnosis, trust me. I drove an hour to be there, getting me out of bed at 3:20 a.m. I believe my son was just going to bed as I was waking up.) The interviews were fun, I was given the opportunity to put two different producers into trance, live on the air. The phone at the store rang off the hook. There were so many people calling to say they would attend, we decided to break the hour into two one hour segments. That way, more could attend comfortably, we figured. The building was filled to capacity. 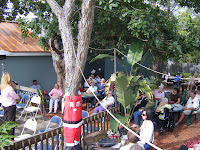 The second event, we moved outside to a lovely garden area the store has, it was full. 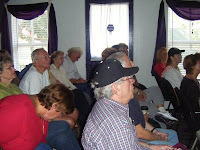 I ended up giving a third talk on Sunday, so those who could not fit into the first two were able to attend. At the end of each talk, I did a short hypnotic journey. Reminding people of times they felt happy, safe and content. I asked that they make the memory as real as possible, recalling familiar smells, sounds and images. We intensified the memory as if we were creating a movie in our minds. When the moment of contentment arrived, we placed our index finger and thumb together to make a physical anchor for that moment. Breathing it in and feeling our contentment, we felt our fingers. W e repeated this process 3 times. Now, the simple memory of that moment, touching the fingers together and a deep breath will help us handle any situation life may hand us with calm grace. For me, the pleasure was seeing so many people walk away with some new idea that they could use in their own life to better their thoughts. I tried to fit as much into each hour as I could. Perhaps my favorite suggestion for one and all is to look up. That’s right, look up. You see, when we look up as we discuss a concern, the emotion drains and we can get into fact finding and solution creating. Think about it this way, when we pray, we look up to the heavens. When we feel optimistic we say, “things are looking up”. Where does a person who is depressed look? So my friends, look up! Speak your concerns while looking up, then breathe deep and close your eyes. Allow your eyes to relax and begin to imagine a future moment where the concern is behind you. You are now looking ahead, fear is behind you. Breathe into that moment, that solution and realize that fear only exists in your thoughts. Sounds like a big success to me.Good job. I checked out your videos with your interview segments on 10 Connects…Great Job!! I loved what you achieved with Chris especially!